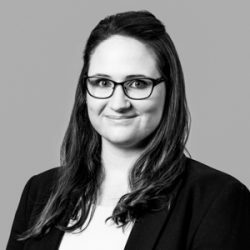 Joanna enjoys a broad commercial and administrative law practice and accepts briefs involving advice and appearance work, as well as junior briefs in larger commercial matters. Questions of issue estoppel, choice of law, mortgagee sales and directors’ duties. Joanna has also worked as a solicitor with the Victorian Legal Services Board and Commissioner, providing advice on the application of the Legal Profession Uniform Law (Victoria) and appearing for the Board in the Supreme Court and Magistrates’ Court in civil and commercial matters. Joanna holds undergraduate degrees in Arts and Law (with First Class Honours) from Monash University and won three subject prizes as part of her Law degree. Joanna also completed a Master of Laws at Cambridge University studying international commercial litigation, competition law and intellectual property and obtaining a commercial designation. While at Cambridge, Joanna was also an editor of the UK Supreme Court Yearbook. Joanna is reading with Lisa Hannon and her senior mentor is Timothy McEvoy QC.